I really love this recipe for Wild Rice Quiche. Wild rice is an excellent addition to a smooth, creamy cheesy quiche. You could use other types of rice if you'd like, including basmati or brown rice, but I think this recipe is perfect just as it is. You could also use other vegetables in this quiche. Mushrooms would be good in addition to or in place of the red bell pepper. Or add some chopped green beans or some baby peas. Or change the cheese to Colby, CoJack, or Pepper Jack for some heat. This quiche is perfect for brunch or dinner, especially on a cold winter day. Serve it with a crisp green salad and some steamed or roasted asparagus. Pre-bake the pie shell for 5 to 8 minutes or just until the crust begins to brown. Set the crust aside on a wire rack while preparing the filling. In a medium skillet, sauté the red bell pepper and onion in the olive oil until tender over medium heat, about 5 to 7 minutes. Add the cooked and drained wild rice to the skillet and set aside off the heat. Combine the eggs, sour cream, mustard, and pepper in a medium bowl and beat well with a wire whisk until blended and smooth. Sprinkle half of the Havarti cheese over the pie crust, then spread the wild rice mixture over the cheese. Pour the egg mixture over all and sprinkle with the remaining Havarti cheese. Sprinkle with the Parmesan cheese. 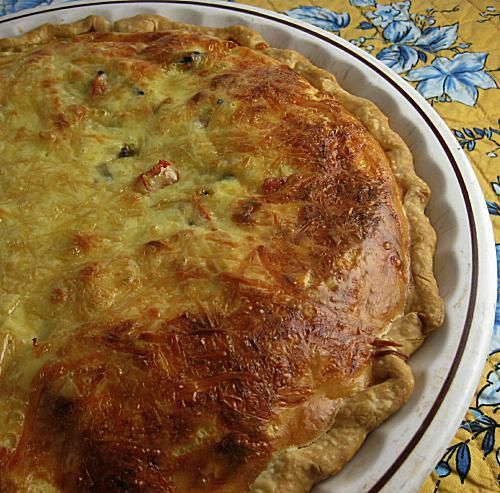 Bake the quiche for 30-35 minutes or until filling is puffed, set and golden brown around the edges. Let stand for 10 minutes on a wire rack before cutting.